This document details the wiring of a basic electronics board for bench-top testing. Some images shown in this section reflect the setup for a Robot Control System using Spark motor controllers. 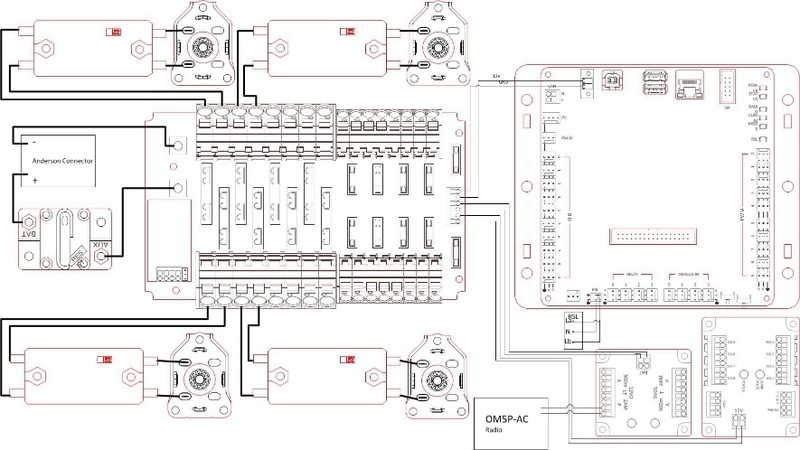 Wiring diagram and layout should be similar for other motor controllers. 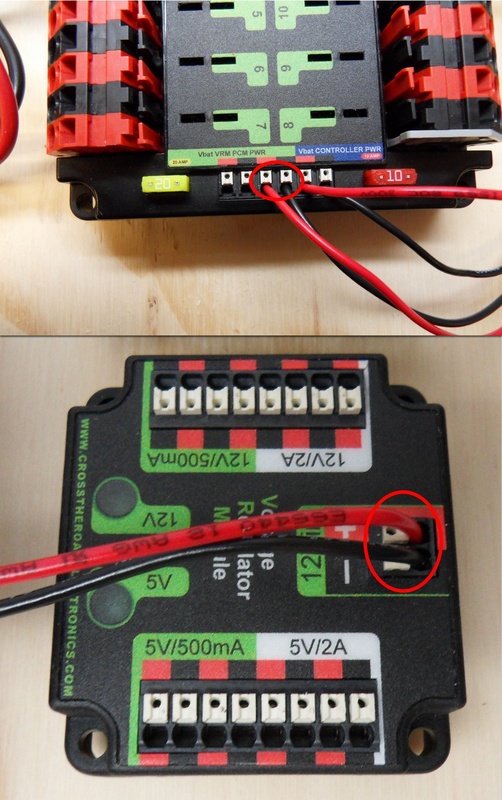 Where appropriate, a second set of images shows the wiring steps for using PWM controllers with integrated wires. 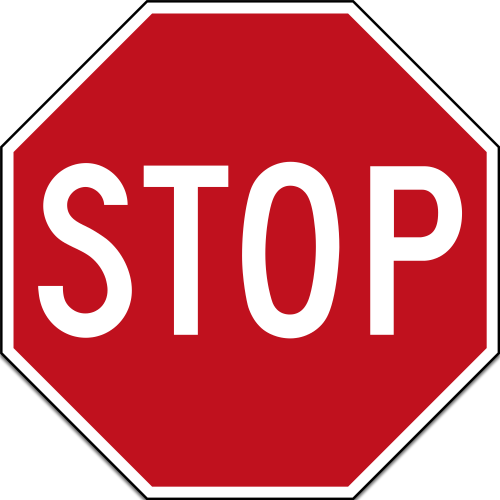 For a benchtop test board, cut piece of 1/4” or 1/2" material (wood or plastic) approximately 24" x 16". For a Robot Quick Build control board see the supporting documentation for the proper size board for the chosen chassis configuration. Layout the components on the board. One layout that should work is shown in the images above. Using the Dual Lock or hardware, fasten all components to the board. Note that in many FRC games robot-to-robot contact may be substantial and Dual Lock alone is unlikely to stand up as a fastener for many electronic components. Teams may wish to use nut and bolt fasteners or (as shown in the image above) cable ties, with or without Dual Lock to secure devices to the board. Attach terminal lugs to battery connector. Using a 1/16" Allen wrench, remove the two screws securing the PDP terminal cover. Using a 5mm Allen wrench (3/16" will work if metric is not available), remove the negative (-) bolt and washer from the PDP and fasten the negative terminal of the battery connector. Secure one terminal lug to the end of the 6AWG red wire. Using the 7/16" box end, remove the nut from the "AUX" side of the 120A main breaker and place the terminal over the stud. Loosely secure the nut (you may wish to remove it shortly to cut, strip, and crimp the other end of the wire). Measure out the length of wire required to reach the positive terminal of the PDP. Cut, strip, and crimp the terminal to the 2nd end of the red 6AWG wire. 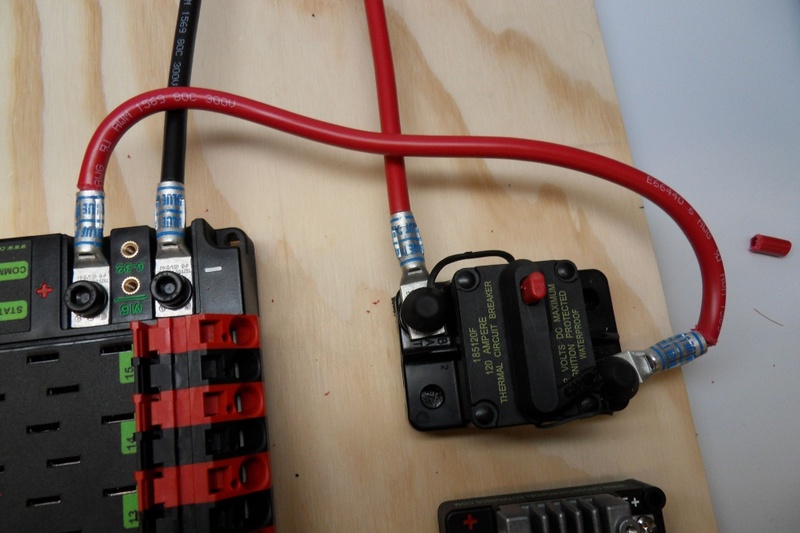 Using the 7/16" box end, secure the wire to the "AUX" side of the 120A main breaker. Using the 5mm, secure the other end to the PDP positive terminal. 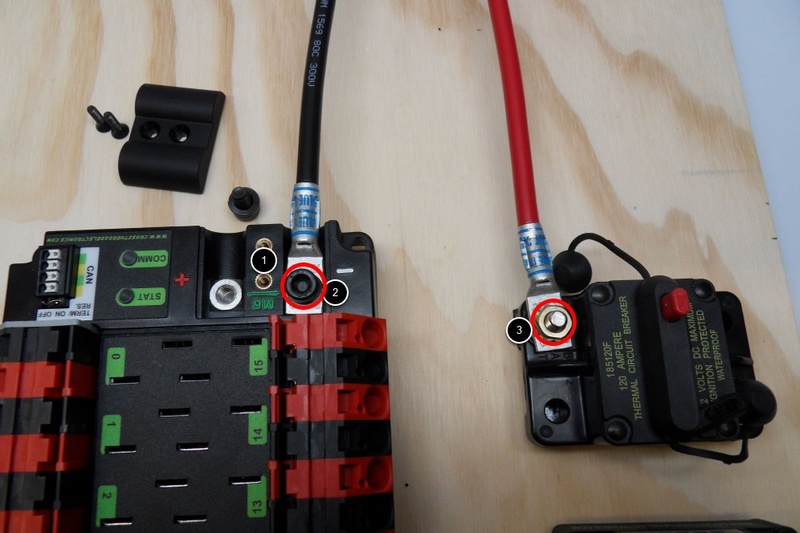 Using electrical tape, insulate the two connections to the 120A breaker. Also insulate any part of the PDP terminals which will be exposed when the cover is replaced. 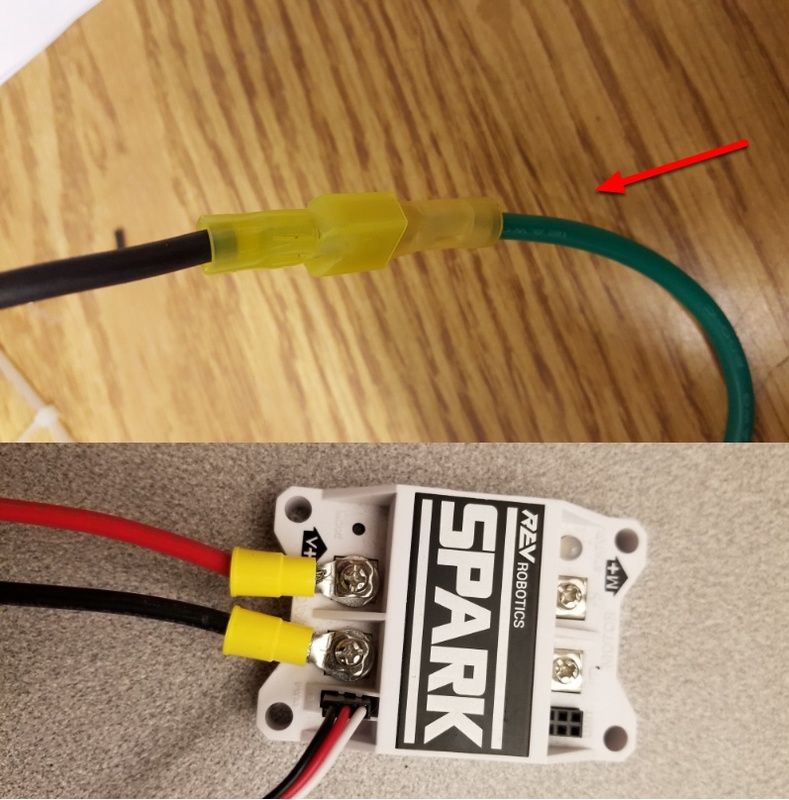 One method for insulating the main breaker connections is to wrap the stud and nut first, then use the tape wrapped around the terminal and wire to secure the tape. To maximize pullout force and minimize connection resistance wires should not be tinned (and ideally not twisted) before inserting into the Wago connector. Cut and strip the red and black power input wires wire, then insert into one of the 40A (larger) Wago terminal pairs. Strip one end of each of the wires, then insert into the Wago terminals. The correct strip length is ~5/16" (8mm), not the 5/8" mentioned in the video. Wire ends should be stripped approximately 5/16"
Tug on the wire to verify that it is seated fully. If the wire comes out and is the correct gauge it needs to be inserted further and/or stripped back further. Measure the required length to reach the power input on the roboRIO. Take care to leave enough length to route the wires around any other components such as the battery and to allow for any strain relief or cable management. Cut and strip the wire. Using a very small flat screwdriver connect the wires to the power input connector of the roboRIO (red to V, black to C). Also make sure that the power connector is screwed down securely to the roboRIO. Strip ~5/16" on the end of the red and black 18AWG wire. Connect the wire to one of the two terminal pairs labeled "Vbat VRM PCM PWR" on the PDP. Measure the length required to reach the "12Vin" terminals on the VRM. Take care to leave enough length to route the wires around any other components such as the battery and to allow for any strain relief or cable management. Cut and strip ~5/16" from the end of the wire. Connect the wire to the VRM 12Vin terminals. Note: The PCM is an optional component used for controlling pneumatics on the robot. Measure the length required to reach the "Vin" terminals on the VRM. Take care to leave enough length to route the wires around any other components such as the battery and to allow for any strain relief or cable management. 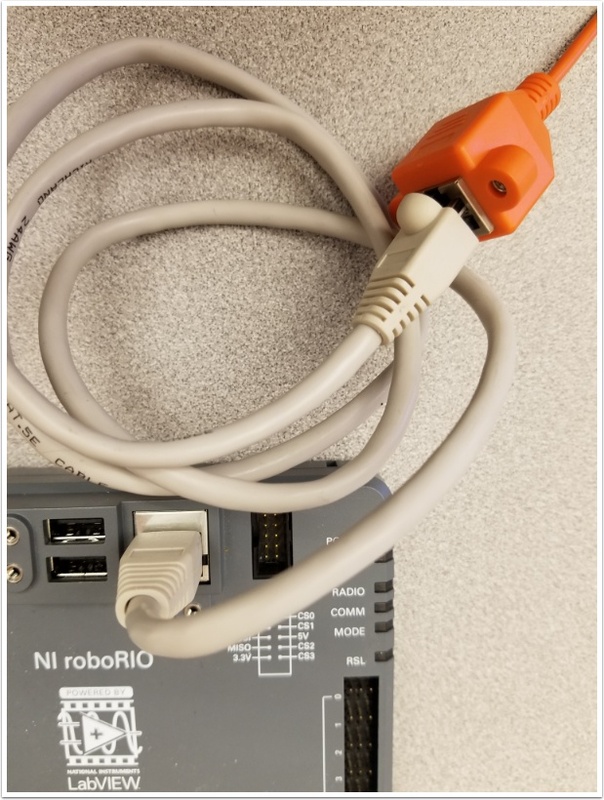 DO NOT connect the Rev passive POE injector cable directly to the roboRIO. The roboRIO MUST connect to the female end of the cable using an additional Ethernet cable as shown in the next step. Insert the ferrules of the passive PoE injector cable into the corresponding colored terminals on the 12V/2A section of the VRM. 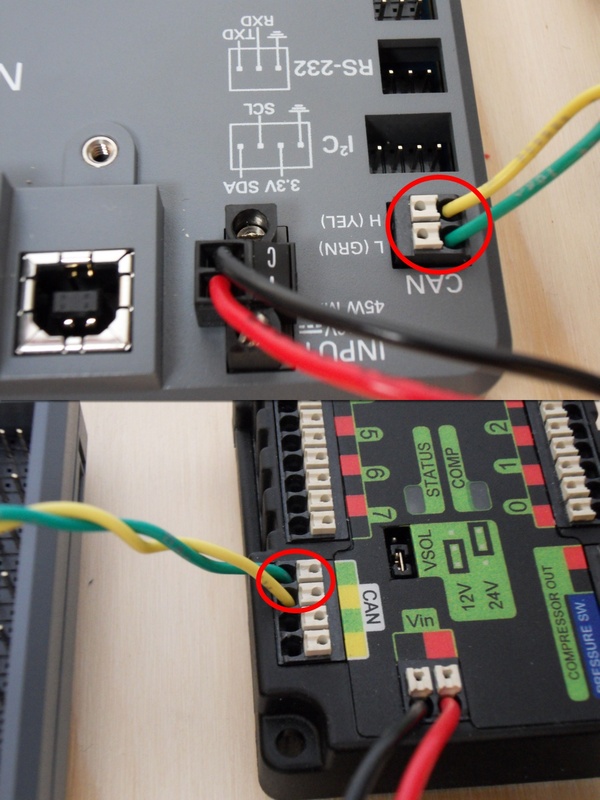 Connect an Ethernet cable from the female RJ45 (Ethernet) port of the Rev Passive POE cable to the RJ45 (Ethernet) port on the roboRIO. Note: The PCM is an optional component used for controlling pneumatics on the robot. 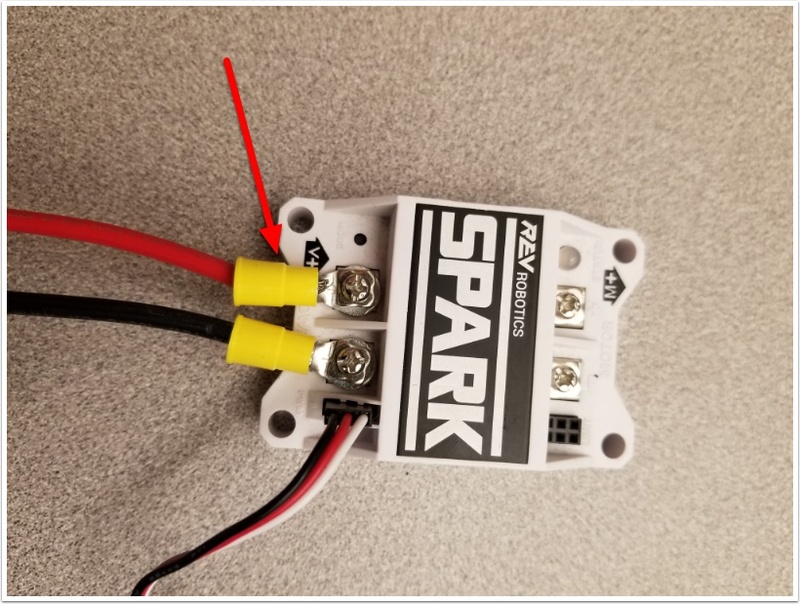 If you are not using the PCM, wire the CAN connection directly from the roboRIO (shown in this step) to the PDP (show in the next step). Strip ~5/16" off of each of the CAN wires. Insert the wires into the appropriate CAN terminals on the roboRIO (Yellow->YEL, Green->GRN). Measure the length required to reach the CAN terminals of the PCM (either of the two available pairs). Cut and strip ~5/16" off this end of the wires. Insert the wires into the appropriate color coded CAN terminals on the PCM. You may use either of the Yellow/Green terminal pairs on the PCM, there is no defined in or out. Note: The PCM is an optional component used for controlling pneumatics on the robot. If you are not using the PCM, wire the CAN connection directly from the roboRIO (shown in the above step) to the PDP (show in this step). Insert the wires into the appropriate CAN terminals on the PCM. Measure the length required to reach the CAN terminals of the PDP (either of the two available pairs). Cut and strip ~5/16" off this end of the wires. Insert the wires into the appropriate color coded CAN terminals on the PDP. You may use either of the Yellow/Green terminal pairs on the PDP, there is no defined in or out. Note: The PDP ships with the CAN bus terminating resistor jumper in the "ON" position. It is recommended to leave the jumper in this position and place any additional CAN nodes between the roboRIO and the PDP (leaving the PDP as the end of the bus). If you wish to place the PDP in the middle of the bus (utilizing both pairs of PDP CAN terminals) move the jumper to the "OFF" position and place your own 120 ohm terminating resistor at the end of your CAN bus chain. Connect the PWM cables from each controller directly to the roboRIO. 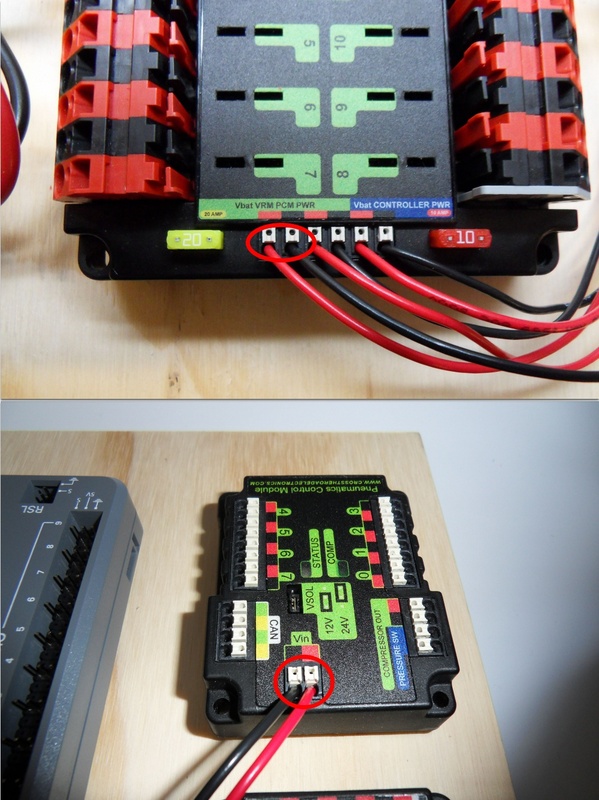 For Victor SPX's and other PWM/CAN controllers, the green wire (black wire for non-integrated controllers) should be towards the outside of the roboRIO. 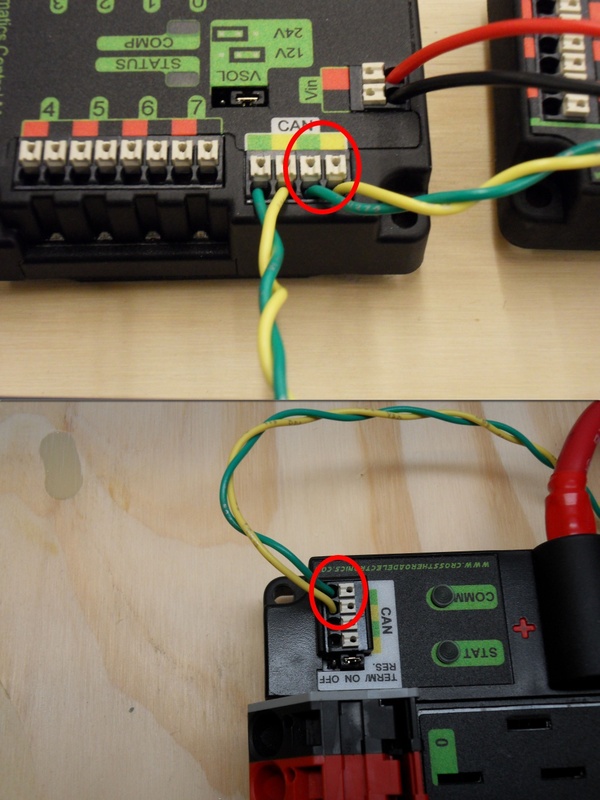 For controllers without integrated wires, make sure the controller side of the black wire is located according to the markings on the controller. It is recommended to connect the left side to PWM 0 and 1 and the right side to PWM 2 and 3 for the most straightforward programming experience, but any channel will work as long as you note which side goes to which channel and adjust the code accordingly. Connect 1 PWM Y-cable to the PWM cables for the controllers controlling one side of the robot. The brown wire on the Y-cable should match the green/black wire on the PWM cable. Connect the PWM Y-cables to the PWM ports on the roboRIO. The brown wire should be towards the outside of the roboRIO. It is recommended to connect the left side to PWM 0 and the right side to PWM 1 for the most straightforward programming experience, but any channel will work as long as you note which side goes to which channel and adjust the code accordingly. Insert the black wire into the center, "N" terminal and tighten the terminal. Strip the 18AWG red wire and insert into the "La" terminal and tighten the terminal. Insert the red wire from the two pin cable into the "Lb" terminal with the 18AWG red wire and tighten the terminal. Connect the two-pin connector to the RSL port on the roboRIO. The black wire should be closest to the outside of the roboRIO. 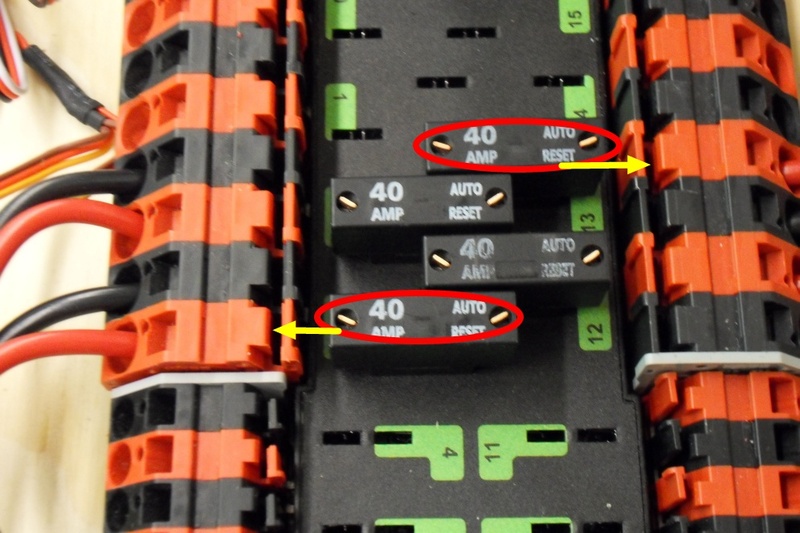 Insert 40-amp Circuit Breakers into the positions on the PDP corresponding with the Wago connectors the Talons are connected to. 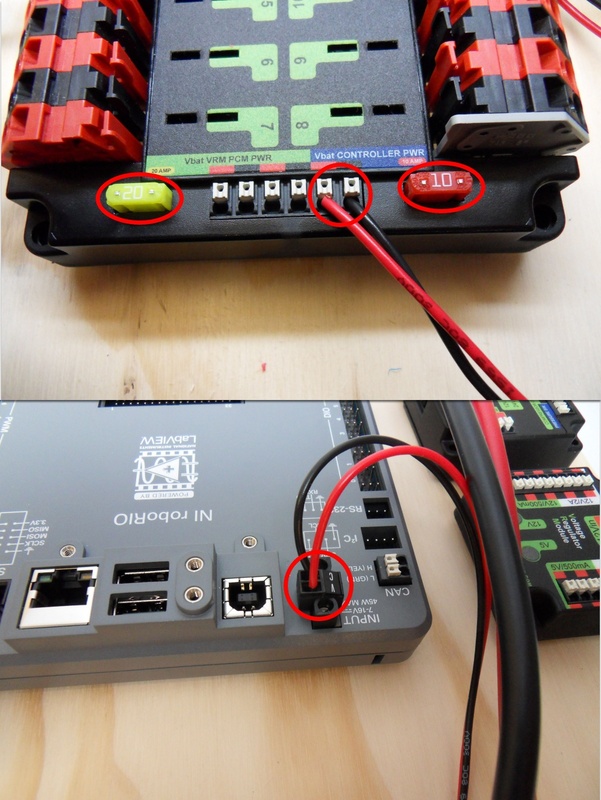 Note that, for all breakers, the breaker corresponds with the nearest positive (red) terminal (see graphic above). All negative terminals on the board are directly connected internally. If working on a Robot Quick Build, stop here and insert the board into the robot chassis before continuing. Connect the motor wires to the controller output wires (it is recommended to connect the red wire to the white M+ output). The images above show examples using quick disconnect terminals. Crimp a ring/fork terminal on each of the motor wires. 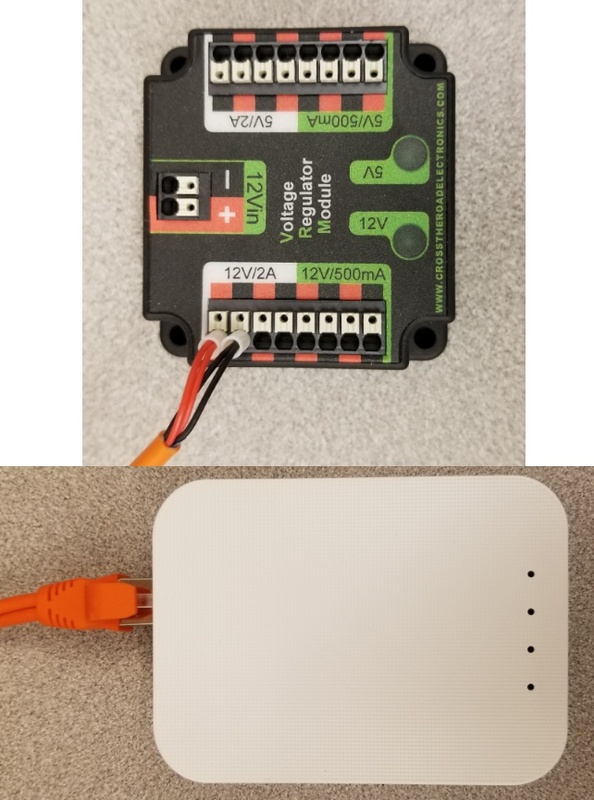 Before plugging in the battery, make sure all connections have been made with the proper polarity. 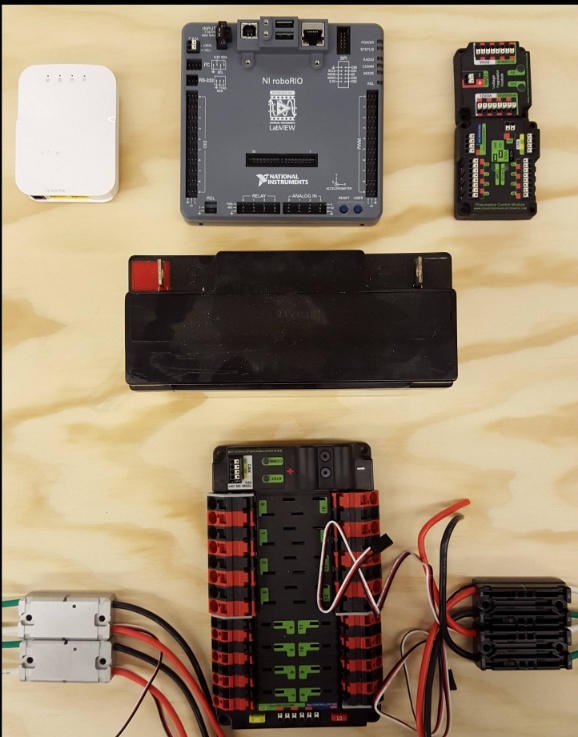 Ideally have someone that did not wire the robot check to make sure all connections are correct. Check that the red wire passes through the main breaker and to the + terminal of the PDP and that the black wire travels directly to the - terminal. 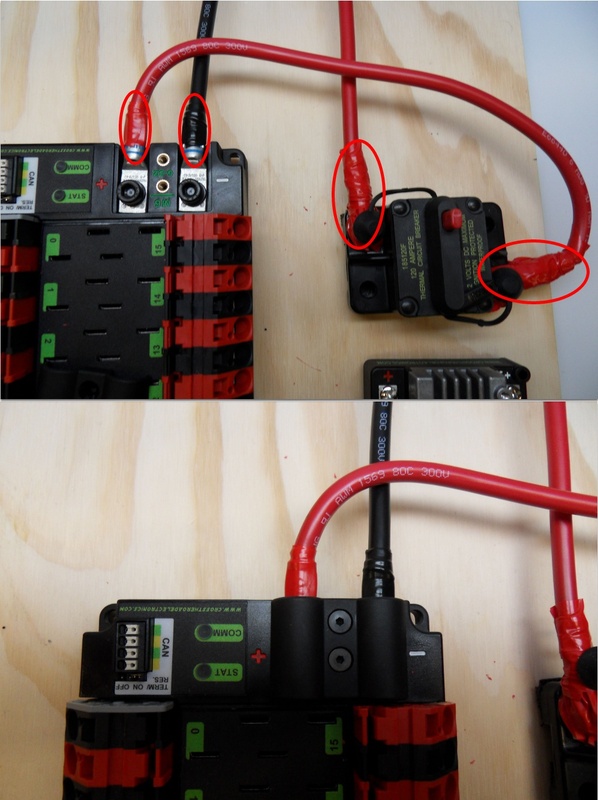 For each device on the end of the PDP, verify that the red wire connects to the red terminal on the PDP and the red terminal on the component. 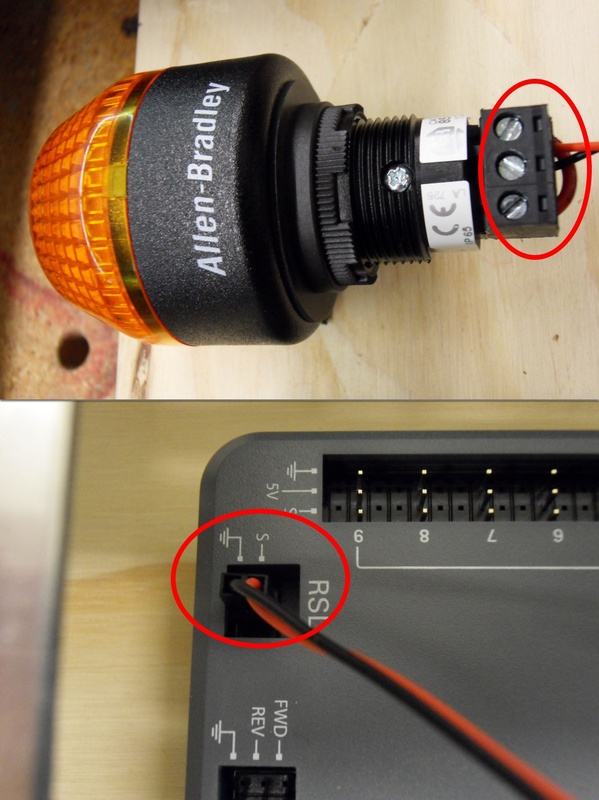 Make sure that the orange Passive PoE cable is plugged directly into the radio NOT THE roboRIO! It must be connected to the roboRIO using an additional Ethernet cable. It is also recommended to put the robot on blocks so the wheels are off the ground before proceeding. This will prevent any unexpected movement from becoming dangerous. Now may be a good time to add a few zip ties to manage some of the wires before proceeding. This will help keep the robot wiring neat. Connect the battery to the robot side of the Andersen connector. 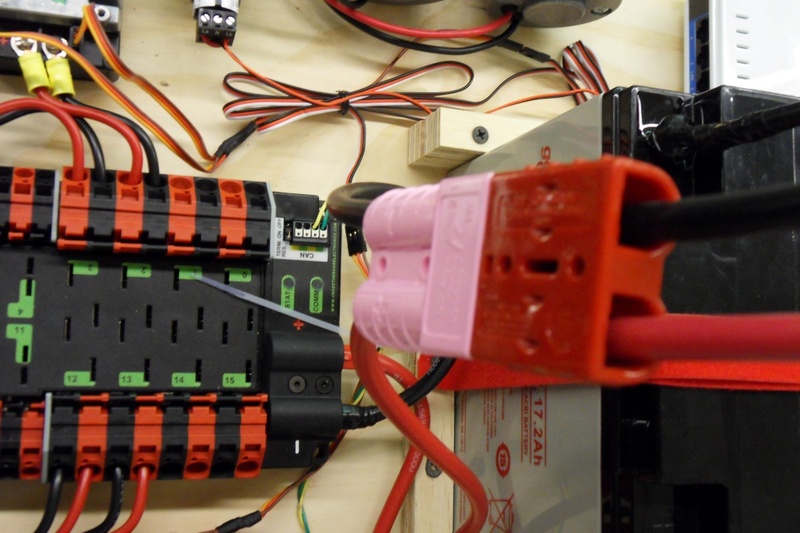 Power on the robot by moving the lever on the top of the 120A main breaker into the ridge on the top of the housing.